The Chinese state media Xinhua News Agency reported on April 5 that the former vice chairman of the Central Military Commission (CMC), Guo Boxiong, had been transferred for prosecution. Xinhua stated that the Military Procuratorate had concluded its investigation against Guo, and that Guo had received huge bribes in person or through his family members by using his power to help others get promoted. Guo confessed to all of these crimes. Only a few minutes after Xinhua published this article, the pro-Xi Jinping media Caixin Net re-published it and attached an excerpt of an article that was originally published after Guo was sacked on July 30 last year. The excerpt revealed how Guo got his fortune, directly specifying the name of Jiang Zemin, his former boss and the former leader of the Chinese Communist Party (CCP). Jiang has been considered the culprit who created a corrupt China during the last two decades. Guo is the highest-ranking general to be prosecuted for corruption since the Chinese communist regime was established. He was promoted by Jiang throughout his career. There have been rumours that Jiang and his two sons, as well as Jiang’s top supporter Zeng Qinghong and his brother, have been controlled internally by the authorities. Guo’s trial indicated that Xi’s process of moving toward arresting Jiang has taken another step forward. The article on Caixin Net revealed the history of Guo’s fortune, starting with the No. 47 Corp. It mentioned that in July 1990, after Guo became the commander of the No. 47 Corp, his first stop was the number-one regiment of Lanzhou Military Region, the No. 415 Regiment in the No. 139 Infantry Division. The article disclosed in detail that Guo had been promoted by Jiang, and it revealed the details of Guo’s allegiance to Jiang. Ji Da, an expert on China issues, believes that the chief editor of Caixin Net, Hu Shuli, has a close relationship with Secretary of the Central Commission for Discipline Inspection Wang Qishan as well as Xi Jinping. He said that when Caixin Net named Jiang just after Guo was prosecuted, it implied that Guo’s trial could be the prelude to Jiang’s arrest. Ji Da said Guo was handpicked by Jiang. 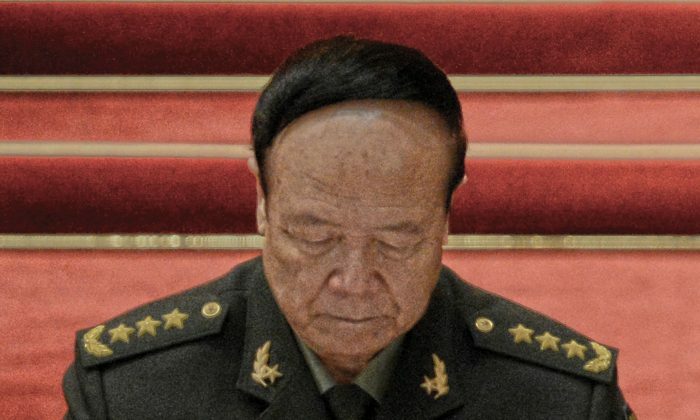 He is the highest-ranking “tiger,” or corrupt official, in the Army, and ranks higher than Jiang’s other confidant, CMC vice chairman Xu Caihou. Guo has been involved in a lot of the corruption of Jiang’s faction, so Guo’s trial could be a major action by Xi and a severe hit to Jiang’s faction. The book “Jiang Zemin and his Origins” has revealed that Guo was only a major general, the commander of the No. 47 Corp in 1992. In the early 1990s, when Jiang inspected Shaanxi Province, he visited the No. 47 Corp on the way. When Jiang took a nap after lunch, Guo guarded him in person, which won Jiang’s favor. Since then, Guo has been promoted all the way to the top. In 1999, Guo was appointed standing deputy chief of the General Staff Headquarters. In September that year, he was added as a CMC member at the Fourth Plenary Session of the CCP’s 15th Congress and was awarded the rank of general. Guo skipped the post of Chief of General Staff Headquarters in 2002 and became the first one to be promoted as a member of the Politburo and the vice chairman of the CMC. In 2002, when Jiang stepped down from the position of CCP leader, he put Guo in the position of CMC’s vice chairman. Jiang increased the Politburo membership from 7 to 9 at the CCP’s 16th Congress. Quite a few of the members are Jiang’s confidants. Jiang assigned an area to each of the members to overhead his successors, Hu Jintao and Wen Jiabao. At the CCP’s 16th Congress, Jiang also instigated Zhang Wannian, Guo and others, forcing Hu Jintao to agree to a provisional motion of keeping Jiang in his post of CMC Chairman. This was considered a “quasi-military coup” by outsiders. After Jiang stepped down from the post of CMC Chairman in 2004, Guo became Jiang’s spokesman in the military. After Xu’s news of stepping down was announced on June 30, 2014, rumors about Guo’s fate kept emerging. Before Guo was arrested, he secretly set Xi a “trap” in an attempt to disrupt everything to protect himself. Xi started a three-day visit to India on September 17, 2014, the first time a Chinese president visited the country since 2006. However, about 800 communist soldiers suddenly crossed the border for 3 kilometers and were stationed on the Indian side on the same day, which caused a media outcry. According to a survey by Epoch Times, the Chinese-Indian soldiers’ confrontation site, the Ali region of Tibet in China, belonged to the No. 13 Regiment of Xinjiang Corp. They have about 800 people belonging to Lanzhou Corp, from which Guo got his fortune. This incident exposed the spoiler force in the Jiang faction. Xi started to purge the army immediately after he returned. At the same time, the news of Guo’s home being raided spread on the Internet. On May 12, 2008, a Richter 8 earthquake occurred in Wenchuan County in Sichuan Province occurred. When then-CCP Premier Wen Jiabao got to the disaster area for the first time, he ordered that the road to Wenchuan be opened up. However, the army didn’t move at all. At that time, Guo did go to Sichuan, but he refused to listen to Wen. Guo established a military earthquake relief headquarters and made himself the chief commander, resulting in Hu’s arriving in Chengdu, Sichuan’s capital city, to support Wen after the 72-hour golden period for lifesaving. Before the end of 2008, then-Chief of General Staff Headquarters Chen Bingde revealed in an article that Hu and Wen could not make any rescue moves with the army in the disaster area within 72 hours after the earthquake. All the military’s actions had to be approved by Jiang, the head of the CMC. Like Bo Xilai, Zhou Yongkang, Xu Caihou, and other sacked “tigers,” Guo’s crime on the surface was corruption, but he also implemented Jiang’s persecution policy against the Falun Gong spiritual discipline. A series of surveys by the overseas World Organization to Investigate the Persecution of Falun Gong (WOIPFG) showed that Jiang and the Communist Army, later led by Guo and Xu, played a leading role in the live organ harvesting carried out against Falun Gong practitioners. A set of investigation recordings made by WOIPFG confirmed further that the commands to harvest organs from Falun Gong practitioners for transplants directly came from Jiang. The senior officials in the CMC were all aware of the situation, and the General Logistics Department of the Army is the core institution of organ harvesting. From Oct 23 to Nov 4, 2011, Guo, then-CMC vice chairman, visited Central America. During that time, WOIPFG investigators questioned Guo in the name of a secretary of Zhou Yongkang, then-head of the Politics and Law Committee. Guo did not deny the inquiry about harvesting organs from live Falun Gong practitioners for organ transplants, but he emphasized that they could discuss the details confidentially by phone. Translated by Libei. Edited by Sally Appert.